From March to October tours operate on Mondays, Wednesdays, Thursdays, Fridays and Saturdays. From November to February tours operate only on Fridays and Saturdays. Tours run throughout the year. We are comparing Lisbon Sunset Walking Tour with Fado Performance Prices from leading ticket suppliers and Try to find you Cheap tickets prices on the market. The Lisbon sunset walking tour with Fado performance is a convenient city tour which can introduce visitors to a variety of aspects of Lisbon's culture, both modern and historic. The tour will begin on Restauradores Square where you will meet with your guide and your fellow tourists. During the tour you will be led through Lisbon's historic streets while your expert local guide fills you in on the facts and stories behind each famous landmarks and buildings. Walk past the old City Gates on Rua das Portas de San Antao, ride the iconic Tram 28 into the heart of the Alfama district to discover original Fado houses, past grand monasteries and hidden churches to a spectacular viewpoint over the River Tagus. You'll get the chance to see a Live Fado Show performed at an authentic tavern and favourite venue for locals. Here you can opt to taste a traditional liqueur, Ginjinha while listening to the musician's soulful performance. The grand finally to this tour is dinner with wine served at traditional Portuguese Tapas House. This is an ideal tour for people who would like a diverse experience of the city, foodies and music lovers will defiantly enjoy this tour. Ideal for visitors who would like an overview of Lisbon's history and modern culture. Children over the age of 12 with an adult are welcome, but will not be allowed to drink alcohol. This is a sociable tour, a great option for individuals to meet other solo travellers. Your Experience With Lisbon Sunset Walking Tour with Fado Performance? Enjoy and evening tour of Lisbon with a difference, combining a walking tour with local food tastings and a cultural music performance. Discover some of Lisbon's hidden sights and interesting land marks with a knowledgeable local guide. Sample tasty local foods, delicious wines, and a traditional liqueur. Ride an iconic Lisbon city tram. 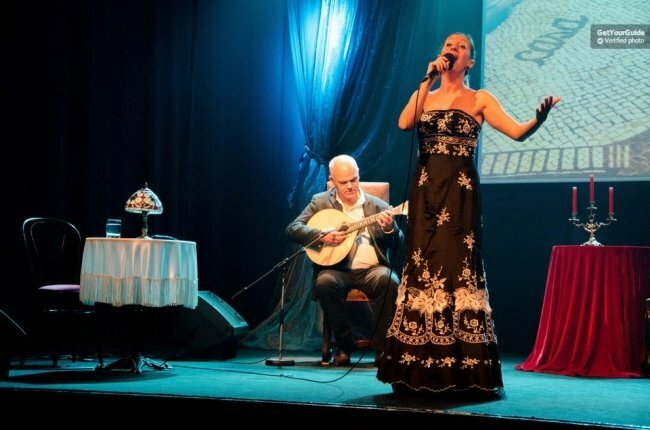 See one of Lisbon's best Live Fado Performances. What Lisbon Sunset Walking Tour with Fado Performance Includes? Tapas dinner with wine or soft drink. Tasting of local beverage, Ginjinha (for adults only. This is a very highly rated tour which only has space for 12 people if you are travelling in a large group or during peak season you should make your reservation in advance as tickets may sell out. Travelers Reviews about Lisbon Sunset Walking Tour with Fado Performance? Travellers have rated the Lisbon sunset walking tour with Fado Performance as a 5-star experience on TripAdvisor, the reputable company is partnered with Viator who are one of the tour providers. Comments have been left by friends, couples, and parents with children which suggests that this is a great experience for all types of visitors. All comments left appear to be positive, particularly regarding the tour guides. Ticket confirmation will be received via instant email. Please print your ticket or bring a mobile version. Cancellation policies depend on individual ticket providers, please check before making your reservation. Tickets purchased from Get Your Guide and Viator are fully refundable up to a fixed number of days prior to your scheduled tour. Please wear comfortable shoes, a moderate amount of walking is required during this tour, and please check the weather forecast in advance and come prepared. This is a small group tour with a maximum number of 12 participants. Please enter any dietary requirements in advance (including vegetarians) using the ‘Additional Information' box while making your booking or contact info@lisbonurbanadventures.com. This tour will not allow participants under the age of 12. Sunset may not be visible on tours which take place in the winter season (between October and March). Meeting Point: In front of the Obelisk Monument on Restauradores Square, Central Lisbon. (Located between Avenida da Liberdade and Rossio.